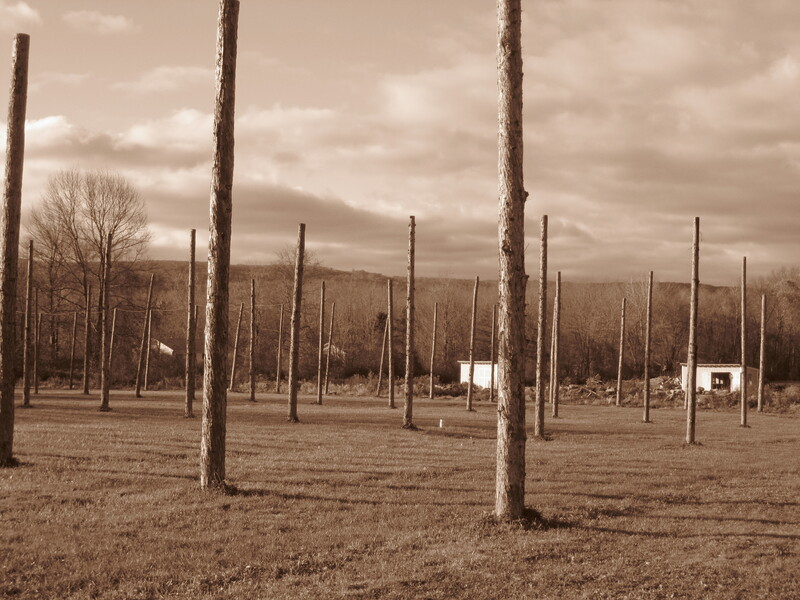 Posts for future hop bines at the future site of Kent Falls Brewing, Kent, Conn.
A few weeks ago I had a great visit to the future site of Kent Falls Brewing in Kent, Conn. The site is on Food Cycle Farm, with two greenhouses for vegetables and an area for chickens. Eventually, pending permit approval, it will become a nanobrewery, fueled and supplied as much as possible by the farm itself. I went on a brief tour led by co-manager Barry Labendz, who took a friend and me from the greenhouses to the chicken farm. Another manager — and head brewer — Dan Moss, shared the brewery’s rye saison, made on homebrew equipment. He said that it will be a while before the brewery is up and running. Here are a few photos from my visit. Follow their progress on Twitter: @kentfallsBC, and check out their webstite at www.thefoodcycleny.com.